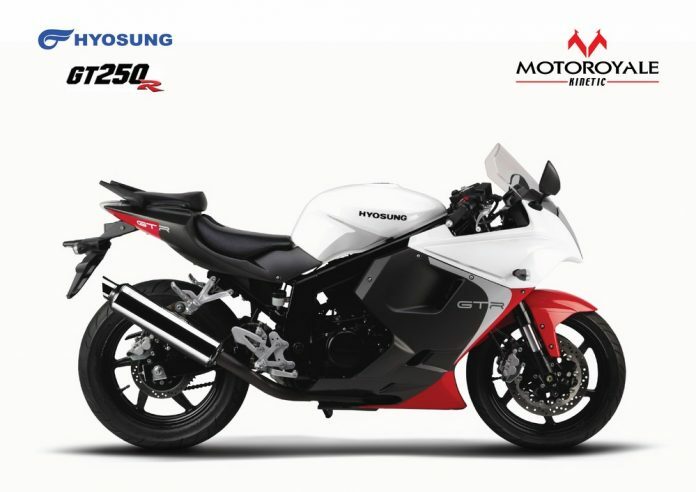 Hyosung has made a comeback after their split with financially troubled DSK Motowheels of Pune. 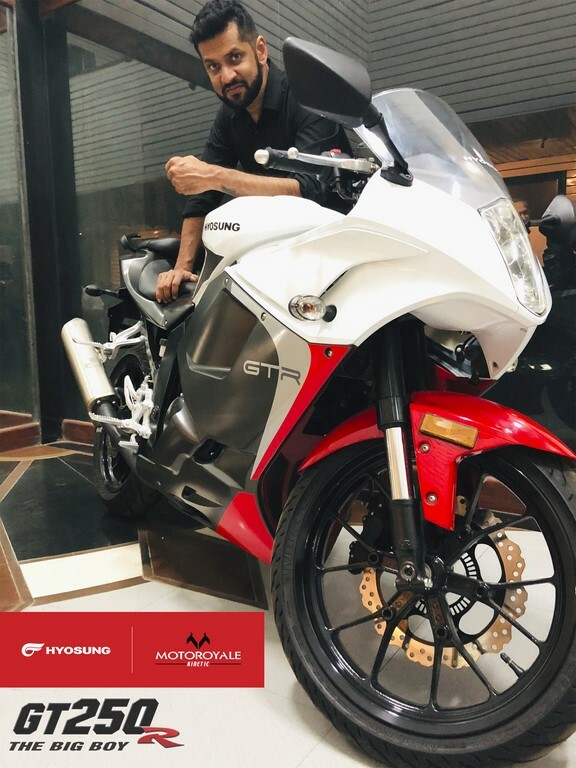 This time they have partnered with Kinetic, which under its MotoRoyale brand will distribute and service their motorcycles in India. At an event they re-launched two motorcycles – GT 250R as well as Aquila Pro. While we are compiling a different story for the cruiser, let us talk about the quarter liter first..
2018 GT250R is powered by a 249cc, 4-stroke, V-Twin, DOHC, Oil-Cooled, 8-valve engine which is capable of producing 28 bhp of peak power at 10,000 rpm and 22 Nm of maximum torque at 7000 rpm. It is paired with a 5-speed transmission. According to the specs of the Indian model shared by Kinetic, the full faired motorcycle gets 43 mm upside down front forks and braking power is provided by 300 mm double disc brakes at the front and a 230 mm single disc rotor at the rear. But for some reason the display motorcycle at the event was shod with a single front rotor. We will try to take an official confirmation from Kinetic on this soon. ABS is standard on the GT and with a healthy fuel capacity of 17 liters, GT250R tips the scale at hefty 188 kg! In terms of pricing, it sits right in between its chief rivals – 2018 Ninja 300 and Yamaha R3. It will also compete with other rivals like KTM RC390 and Honda CBR250R. Apart from this, Kinetic has also introduced an all-new, very interesting 250 cc – details here.